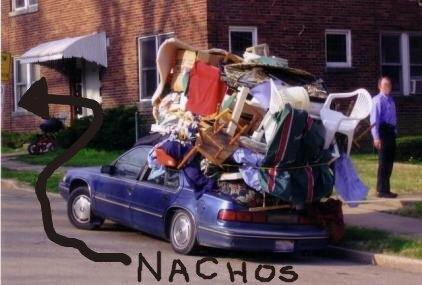 As our loyal fans know, Nacho Patrol World Headquarters is on the move. After two years slumming it in Brookline, we’re packing up the corn chips, sweeping away the old cheese, cleaning out the chili crock pot, and making our way across the river to the scenic Somerville/Cambridge border. What our new home lacks in yard space, it makes up for in pure colonial charm, and we cannot wait to see how it fairs during the first of many Nachopalooza events (block party? ), tentatively planned for September 2010. And that’s where you come in…While we may consider ourselves experts of Boston geography, we have a few blind spots when it comes to the southern neighborhoods. If you’ve got any noteworthy nacho noshing spots you want us to review before we make our way north, please get in touch with us via Twitter, Facebook, a comment below, or at our email (nachopatrol@gmail.com). We welcome all suggestions, especially outlandish ones.